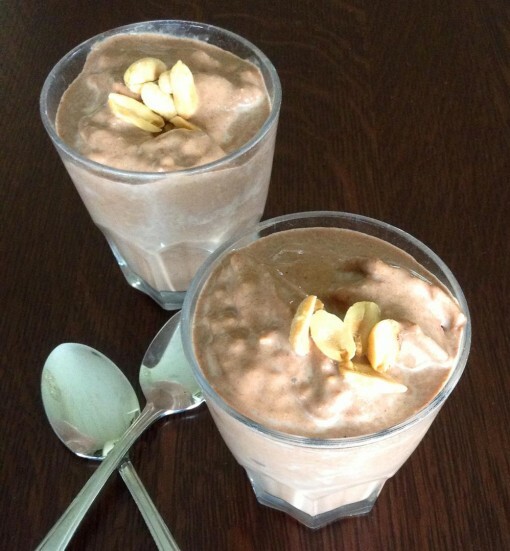 Low Sugar Chocolate PB Dessert Shake was posted on August 27th, 2013 and is filed under Drinks & Smoothies, Gluten Free, Kid Friendly, Low Carb, Protein, Recipes. This entry has 14 comments. You can follow any responses through the RSS 2.0 Comment Feed. It really is an amazing shake because it’s literally a dessert, but is very low sugar, very low in carbs, high in protein, and healthy fats. Hello miracle. Sometimes it ends up looking a little green, because I can’t resist the urge to put spirulina in it…but I assure you it tastes the same! If you’re not a PB fan, simply skip it! Also, if you’re into superfoods like me, feel free to add some extra love to your smoothie. Maca and lucuma are particularly good for this recipe. This will serve 1 large serving, or two smaller servings. Blend everything (except the peanuts) into quiet submission. Then throw in the peanuts and blend until they’re just slightly chopped. 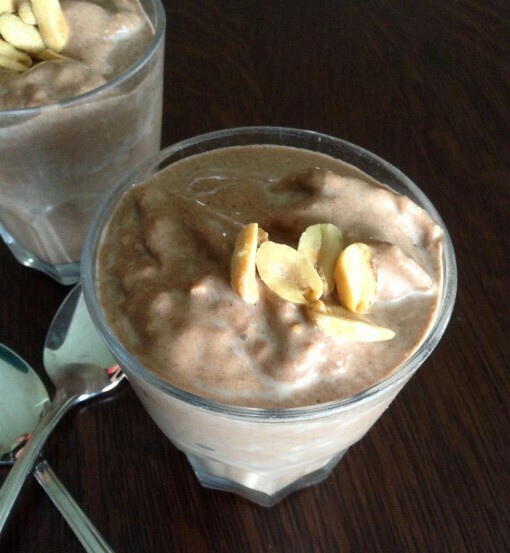 If you like eating your smoothies like ice-cream in a bowl (like me) throw in a few more peanuts and some raw cacao nibs (these are the ones I like) and enjoy! Reeses Pieces in a bowl – without all that sugar! When my sweet tooth is about to get the best of me, this is my go-to shake. Because. It’s. Just. That. Good. Do you drink smoothies for dessert? I guess it is still August. I wish I was able to participate in this year’s challenge, but August is such a busy month for me (can you believe Jacob has already been back in school for a week?). Although I have been enjoying my usual smoothies, I just haven’t made time to photograph them/tweet them for the world to see on a regular basis. Congrats to everyone who has. I can see why they are going crazy for this smoothie. I’d make it with coconut cream. Yum! Just when I thought chocolate and pb couldn’t get any better..Can’t wait to give it a try! Instead of ice, I would recommend using bananas to make it creamier. Just a thought– thanks for the recipe! Tess – This is a low carb/low sugar shake – that’s why there’s no banana…but it’s up to you! I find the heavy cream makes it more than enough creamy, without the sugar spike. Sounds amazing! And I love your outfit in that picture! Super cute. Is there a specific reason why you use almond milk but then use whey protein? Brittany – I’m a fan of vegan foods, but I’m not vegan. The almond milk is a lower cal option & whey protein makes it creamier. Feel free to substitute w/ vegan alternatives & let me know how it goes! Awesome recipe, I cannot wait to try it when my throat gets better again for some healthy, cold drinks! thanks so much! Also, I do love the stainless steel straw and would love to try one out as I work for a health & wellness network. But, does it hurt your mouth/teeth? Especially if your mouth hits against it? 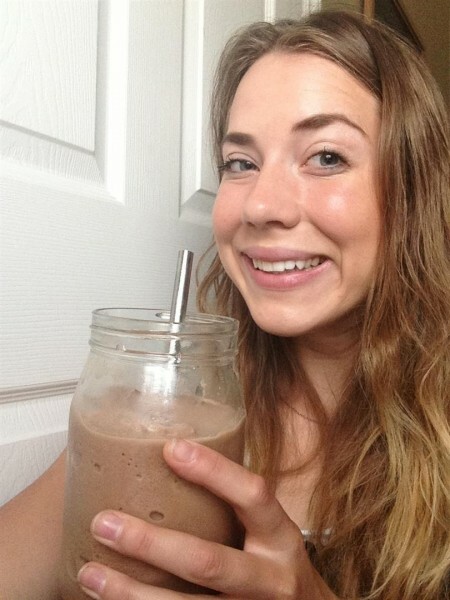 Nadia – I love these cold milkshakes too! The stainless steel straw doesn’t hurt now…although I suppose subconsciously I’m more careful. I love my straw! I do a similar one…I use cottage cheese in it to replace a meal. Yum! I was curious, I’ve been looking at stainless steel staws on Amazon…do you like yours? I haven’t decided on a brand yet. Jessica – Nice! I’m going to try to add more cottage cheese to my smoothies! Great protein! I LOVE my stainless straw, it’s really a product sent with love! I’m sure the ones on Amazon are great too though!